Yesterday, the Senate Agriculture Committee completed the markup of their 2007 Farm Bill proposal. Congressional Quarterly reported yesterday that, “The Senate Agriculture Committee approved a five-year farm bill Thursday that includes a new subsidy proposal advocated by Chairman Tom Harkin, D-Iowa. “The massive $283 billion reauthorization of farm payments, conservation programs and nutrition supports was approved by voice vote after a two-day markup. As Philip Brasher reported in yesterday’s Des Moines Register, where he discussed Ag Committee activity from Wednesday, “A Senate agreement to set up a new subsidy program sought by Iowa corn growers was threatening to unravel amid opposition from the crop insurance industry. “The program, which would reduce crop insurance premiums for farmers who enroll in it, is a key feature of a draft farm bill that the Senate Agriculture started debating Wednesday. Failure of the deal would be a setback for the panel’s chairman, Sen. Tom Harkin, D-Ia. “But several senators, led by Sen. Pat Roberts, R-Kan., said the program could hurt the federally subsidized insurance system and increase premiums for farmers who stick with traditional subsidy programs. The new program could cost the insurance industry an estimated $2.3 billion over five years. “Roberts proposed changes that would gut key provisions of the plan, rendering it unattractive to farmers, said Ron Litterer, a Greene, Ia., farmer who is president of the National Corn Growers Association. The release stated that, “An amendment accepted by the committee on a voice vote stripped the crop insurance integration from the revenue package. Corn growers support an optional revenue program starting in 2010. “NCGA has received assurances from Senate Agriculture Committee Chairman Tom Harkin, Majority Whip Richard Durbin (D-IL), and Sherrod Brown (D-Ohio) that they will work toward a revenue package that is a viable option for corn producers. To listen to an audio segment included with yesterday’s NCGA press release, just click here (MP3). DTN writer Chris Clayton indicated yesterday (link requires subscription) that, “Initially, Ag Committee Chairman Tom Harkin, D-Iowa, also had in his draft language that would require USDA to use a farmer’s ACR payment to first pay back any crop insurance indemnity the producer may have received before paying the farmer any funds left over. That was a sticking point for some senators from states where farmers are more prone to receive crop insurance payouts. “Sen. Pat Roberts’ (R-Kan.) amendment also took away that language, making farmers eligible to receive an ACR payment on top of crop insurance. Such a change is likely to make the ACR more attractive to farmers like Great Plains wheat growers. “Language struck in the bill also would change the $15-per-acre fixed payment in the ACR. Initially, the proposal would allow a farmer to update base acres and get $15 per acre for the full 100 percent of acres planted. Under the Roberts’ amendment, that $15 payment would be attached to 85 percent of a farmer’s current base acres. Potentially, that 85 percent base could change for ACR enrollees depending on how the Congressional Budget Office projects costs. Dan Morgan, writing in today’s Washington Post, reported that, “The proposed plan, known as Average Crop Revenue (ACR), attempts to address concerns that existing farm programs often pay farmers in bumper years but fall short when revenues plunge because of bad weather or other factors. “Farmers now buy private crop insurance that covers them if overall incomes tumble due to crop failure. The federal government pays part of the premiums, which have been rising. “The ACR plan initially put forward by Agriculture Committee Chairman Tom Harkin (D-Iowa) would have allowed farmers to insure part of their farm revenues directly through the government, costing private crop insurance companies an estimated $2.2 billion over five years, according to the Congressional Budget Office. “Along with an outcry from the industry, Harkin’s plan ran into objections from Western senators who feared that insurance costs would rise as corn growers in the rainy Midwest shifted to the government plan. “‘The option . . . creates a potential battle within agriculture we can ill afford at this time,’ the American Farm Bureau Federation president, Bob Stallman, warned Monday. For a more detailed look at crop insurance issues, see this article, “How to Save Billions in Farm Spending,” by Bruce Babcock, which was published in the latest edition of the Iowa Ag Review. In part, Dr. Babcock stated that, “The most vexing problem facing Congress as it works toward completion of the farm bill is where to find funding to make changes in farm legislation. High commodity prices have drastically reduced available funds that supporters of change can tap to create new programs or expand existing programs. The agricultural committees have found only two significant sources of funds under their control: direct payments and the crop insurance program. Reductions in either program could fund increased nutrition and conservation programs or could be used to redesign commodity programs. The rationale for cutting direct payments is that it is difficult to see why crop farmers should receive subsidy payments when farm income is at record levels. The rationale for cutting crop insurance subsidies is that taxpayer support for the program has ballooned with the higher commodity prices, far outstripping the costs of actually running the program. 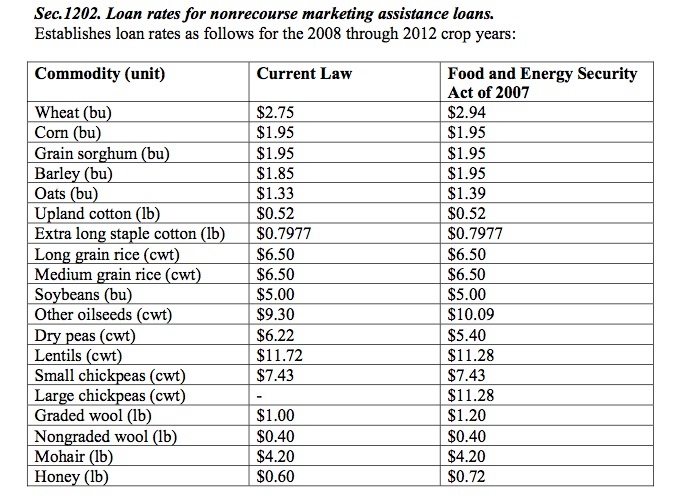 The Iowa Ag Review article went on to state that, “Figure 2 shows the ‘break-even’ percent subsidy for farmers in major corn- and wheat-producing states. Presented are the levels of premium subsidy that if applied to recent premium rates would equate farmer-paid premiums with expected indemnity payments for producers of corn, soybeans, wheat, rice, and grain sorghum in each state. Expected indemnity payments are calculated for two periods: 1980 to 2005 and 1995 to 2005. The longer period is more indicative of expected indemnities if patterns of crop losses in the 1980s and early 1990s are possible in the future. “The break-even premium subsidy for Iowa is 38 percent if future crop losses follow the 1980 to 2005 pattern or 53 percent if the more recent past is indicative of future losses. This means that Iowa farmers have no profit motivation for buying crop insurance until the premium subsidy gets substantial. The same result holds for Illinois, Nebraska, Minnesota, and Indiana. The negative break-even premium subsidies in Ohio, Kansas, and the Dakotas indicate that farmers in these states do not need a premium subsidy to break even because their premium rates are already low enough. “The Figure 2 data indicate that Corn Belt farmers would not buy crop insurance if it were not heavily subsidized whereas farmers in important wheat states would have a profit motive to buy crop insurance even without premium subsidizes. 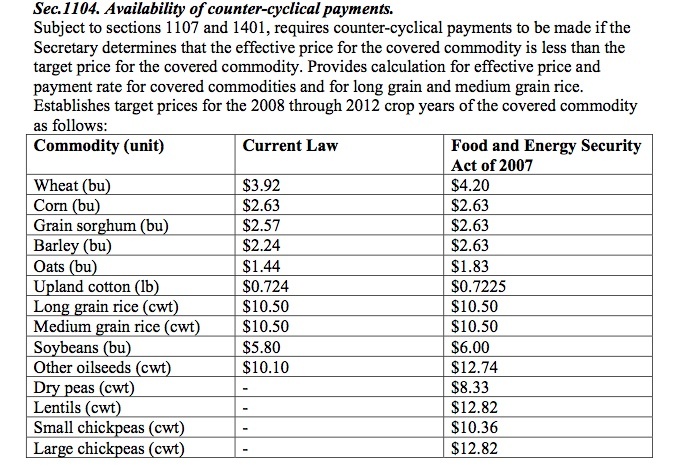 Given that corn and soybeans together represent about 60 percent of the entire crop insurance program, it is only a bit of an overstatement to say that the crop insurance industry is selling a product with so little demand at its current price that without government price subsidies, there would be no viable market. This conclusion is reinforced by the fact that unlike private insurance products, crop insurance premiums do not cover the cost of selling, servicing, and reinsuring the insurance policies. Instead, the government provides direct support to insurance providers through A&O reimbursements and reinsurance. If premiums were set to cover these costs, the break-even premium subsidies in Figure 2 would be much greater. Meanwhile, in other coverage of yesterday’s Senate activity, Associated Press writer Mary Clare Jalonick reported that, “Opponents say the bill helps wealthy farmers too much and should spend more on conservation programs, food aid for the poor or reducing the federal deficit. The AP article added that, “Acting Agriculture Secretary Chuck Conner told reporters Thursday that the Senate committee’s bill ‘really equates to no reform at all’ and may have less of an impact on limiting subsidies than the House bill. But he stopped short of saying the president would veto it. “Lugar did propose cutting $1.7 billion from direct payments –subsidies often criticized because they are not based on current crop production or prices. His amendment would have shifted that money to nutrition programs, including food stamps and emergency food assistance. “It lost by a 17-4 vote. The article stated that, “The bill calls for a one cent increase in the guaranteed government minimum price for sugar growers, or loan rate. Minnesota is the leading producer of sugar beets in the nation. * National Farmers Union– “Because the 2002 Farm Bill saved money, the 2007 bill had to be created with a reduced budget baseline. [NFU President Tom Buis] said that despite this obstacle, the Senators were able to write a good bill. The CQ article added that, “Charles E. Grassley, R-Iowa, and Byron L. Dorgan, D-N.D., say they will offer an amendment to reduce — to $250,000 from $360,000 — the total federal money that any farming operation can receive in a year. Their proposal is intended to prevent agribusiness from getting too much government aid, Dorgan said.